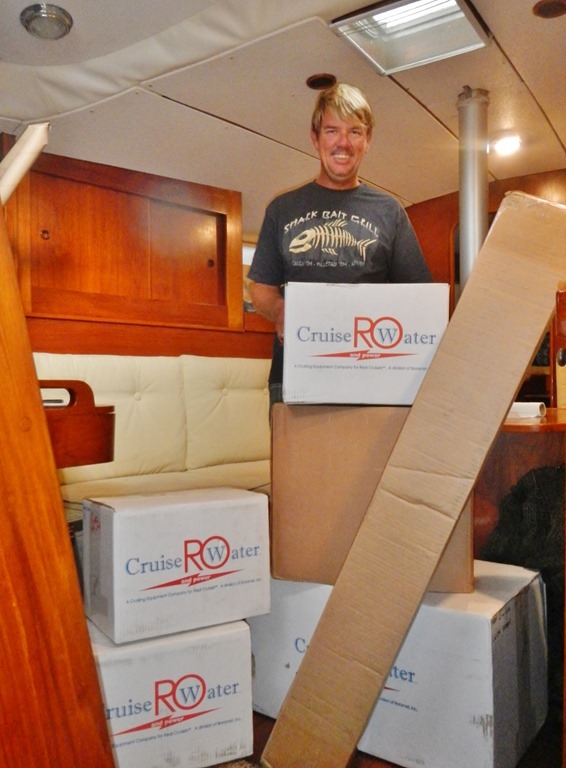 Like kids on Christmas, we giddily collected the six boxes containing the new Cruise RO Seamaker 20 water maker from our friend’s house (Thank you for being both our post office and storage unit!) and piled them onto the boat. Giddy slowly morphed into nervous once we no longer had room to take two steps or even sit in our boat any more. Holy Crap, there were a lot of really BIG boxes! Are you sure we can fit this thing on board?! We lived in a mess for a bit. At least removing the old unit was simple; 4 bolts, 3 hoses, 2 wires and one hand and it was out and onto eBay. Buh-bye Katadyn. Step 2: It doesn’t fit, Oh, yes it does! We thought we had planned out exactly where we were going to put all the parts months ago while still floating about in the Bahamas. Only about an hour into the project we realized the membrane wasn’t going to fit where we thought it would, nor the pump. Not because the size specifications were wrong, but we didn’t account for enough space for the hoses that had to attach. At this point, I will be honest and say I had some serious doubts whether we could get this unit on the boat, at least without sacrificing our storage spaces, which we really couldn’t afford to do. This was the most difficult and time-consuming part of the whole project. We spent a lot of time- many, many day- just staring, both at the space we had to work with and the parts that needed to fit in it. Sometimes we pulled out the tape measure and would remeasure the same spot again. Nope, still won’t fit. Besides physically fitting somewhere other than our storage lockers we really wanted to keep it accessible, not just the filters that need frequent maintenance, but we wanted to be able to see all the fittings and pumps just to keep an eye on things. It was a long road, but in the end I am actually glad it didn’t fit in the original spot as I think our final installation was superior choice. Keith made all the pieces fit, without losing storage, it’s easy to access the filters and they are in a place that’s okay when water gets sloshed when you changed them (because water always gets sloshed). To boot, I think it’s pretty tidy of an installation, at least for being in a workroom. He built out two false walls to mount the control panel and filters on. This allowed all the hoses to be neatly run behind, yet easy to get to if needed. 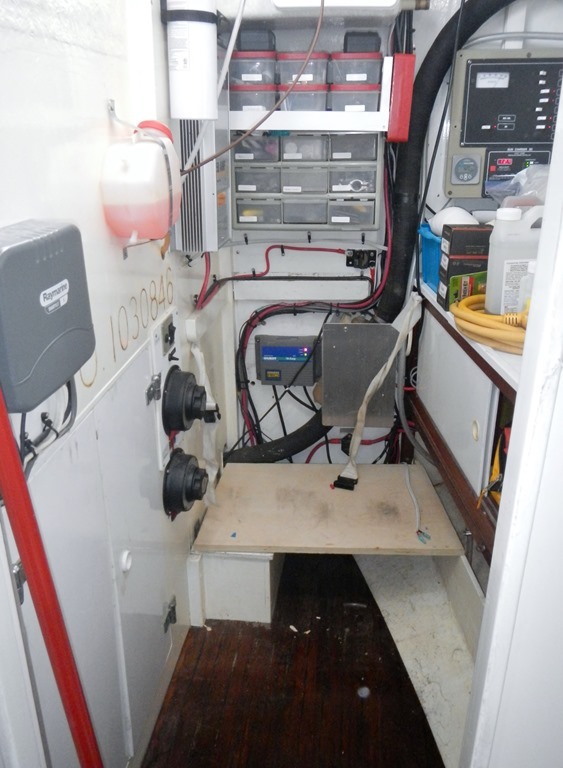 The pumps, the boost and power pump, were built into an awkward little nook that allows for great ventilation, easy access, and if they ever do spout a leak they won’t damage anything as they are on raised mounts and the water would just drain into the bilge. In the end, it fit in just perfectly. Once Keith figured out where all the main pieces were going to go it was time to connect them all together. Cruise RO uses Mur-lock fittings, it was Keith’s first time using them at first he thought it looked like at lot of places to introduce potential failures and he didn’t think he’d be a fan of the push locking mechanisms, but after getting into the project he grew more confident with them- and they were easy to work with. Note, all the high-pressure fittings are Swageloc fittings. There were plenty of full color diagrams and photographs in the 57 page installation manual, so it what was pretty straight forward of a job. It still took a while primarily due to cramped spaces. When I mentioned to Keith “maybe not plug-and-play like the Katadyn,” he said “no ,it is, there is just a lot more plugging and playing”. Behind all those connections is the 12v boost pump and raw water strainer. The saltwater filters and the fresh water back-flush carbon filter housings. It’s a difficult photo, but the pumps. The boost and high pressure. The orange line is because we just used it to pickle the membrane. Step 4: Time to make water…..lots and lots of water……….and lots of phone calls. The original plan had been to wait until we sailed the boat down to Fort Pierce (by the inlet with fresh ocean water) to try out the unit. But, we were excited and slightly impatient to see it work so made a quick change of plans and we decided to fire it up in the river (I’m going to come back to that point in a minute). We read and re-read the instructions for initial startup before finally flipping the first switch. Step one was to make sure there were no leaks in any of the fittings when the boost pump was turned on. Immediately we had water-spraying in the workroom! Obviously there was a leak; it was easily resolved. No big deal and take-two had no more water leaks. The instructions for the process were very clear but we still had lots of questions and concerns through the process. Things like should we be seeing bubbles in the flow meter, should the flow valve be closed all the way to achieve pressures…) We called Cruise RO just to confirm what we were doing. When you call the phone is answered by Rich Boren, the guy who made the water maker and owns the company so he knows everything there is to know about it- no phone tree, no transfer, no tech guy following a flow diagram. Just another cruiser who can answer all your questions immediately. Crazy-good refreshing customer service. We ended up calling six times, pretty much at every step we had another question. We felt kind of ridiculous for calling so much, we were just trying really, really hard not to do anything to mess up and hurt the membrane before we got started and make sure we understood everything we were doing (I’m going to come back to that point in a minute). Rich was very patient and held our hand the whole day. During this initial run the water being made was not being dumped into our water tanks, the point was just to get the pumps broken in and everything set so we had the outlet line just draining into the bilge. The old water maker just made a “dribble-dribble-squirt” kind of flow so we were surprised by the hose when it started whipping around and had to be clamped down once it started making water. It was kind of like a firehose without a fireman at the end. More water everywhere 🙂 We were trying to collect it in containers and buckets because at this rate dumping it into the bilge didn’t seem smart. Neither of us could get over how much water we were getting, not that we were calculating it (I’m going to come back to that point in a minute), but it was much more than we had envisioned! We could barely keep up with emptying the buckets! Somewhere between our excitement, following the checklist, dumping buckets and buckets of fresh water, phone calls, and trying to be so careful we overlooked one very big detail. Thankfully Rich helped catch it for us. On our last phone call of the day to Cruise RO Keith mentioned our high flow rate readings to Rich, who in turn immediately said we needed to address that. Since we were running in brackish water we needed to adjust the flow rate as to not exceed the maximum rated output to avoid damaging the membrane. Crap. We were running at nearly twice that!! No wonder we couldn’t keep up with the buckets! In hindsight, in the first pages of the manual, listed as #4 of things never to do in BIG bold red print it says “In brackish water, such as in an estuary or river, never allow the product water production flow rate to exceed the units rated output. In such cases, simply turn down the system pressure or RO membrane damage will occur.” In all of the excitement, we both overlooked the fact that since we didn’t go to the inlet as planned, and we were still in the river that warning did in fact apply to us now. We were so focused on the two pressure gauge readings that even though we had both briefly wondered out-loud about the flow-rate meter readings, we hadn’t done the quick math of what the reading should have been. Our mistake. We now have that noted on our checklist! Fortunately, we didn’t damage anything, and besides, it’s always good to stress test a new piece of equipment right? Once we got through he initial startup and got the flow adjusted for the brackish water, everything ran perfectly. All the switches and gauges that at first seemed intimidating to me, made sense and not overly complicated at all and Keith was happy with his install. The real treat was testing the water with the TDS meter. We had a reading for under 200ppm, a huge improvement from the Katadyn. We did “pickle” (preserve for non-use) the unit after we got everything running smoothly and I think we will wait until we are in clean, salty water next month to run it again. We can’t wait to see what a difference the Cruise RO makes in our cruising comforts, safety, and cruising range. Water, water, wat-er! Before we made the purchase, several people commented that you can just buy all of the pieces individually and make your own water maker. True, we didn’t see the value though. And, now, after installing the Cruise RO we would never consider it. For one, there are a lot of pieces. I wouldn’t want to have to research, locate, ship, assemble them all one-by-one. Second, with the Cruise RO all the figuring has already been done for you and written in it all out in a well-done manual. It sounds like a small thing, but having all the warnings and reminders already laid out for you is big, and may prevent some expensive errors- even having the standard operating instructions already put together is a huge value. Finally, being able to make a phone call when something isn’t working right-or you just have a question-any day of the week is worth it alone. We really appreciated this on our start up day! The warranty is another consideration. 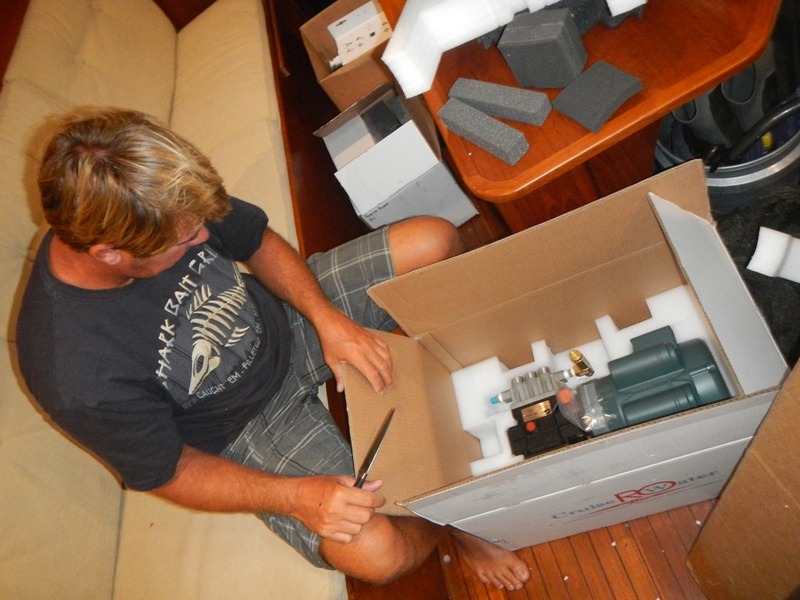 We were very happy with the kit and units and the quality of all the parts. Our only frustration, and it’s very basic, came in the lengths of hose provided. Additional lengths of hose are available when you order the unit so that you can locate each part (pump, membrane, panel..) separately. Even spacing ours as close as they are Keith was continuously running into the problem of not having enough green hose to run it where he wanted to. We would strongly recommend ordering extra hose (its cheap) even if you are installing all the parts in close proximity, it might just make it easier. There were plenty of extra fittings left over. Our old unit (Katadyn powersurvivor 40e) didn’t come with a TDS (total disolved solids) meter and we later figured out why. The Katadyn considers it’s normal operating TDS values to be under 1500ppm. The WHO (World Health Organization) sets the upper safe limit at 500ppm. Yikes! No reason to use a TDS meter when it is always in the red zone. Had we known this little fact maybe we probably would have never purchased the unit. The RO water is our sole source of drinking and cooking water-I’d like it to be in the “safe” range. The Katadyn manual actually states to taste the water. By the time you can taste salt in the water, it is at kidney damaging levels!!! The CruiseRO produces water in the 200’s range and states to call the company if levels reach 500-it is an indication that something is wrong. We were thrilled to test our first run at under 200ppm. First, if you are interested in the specifics about the unit we installed, you can check them all out on the Cruise RO website. 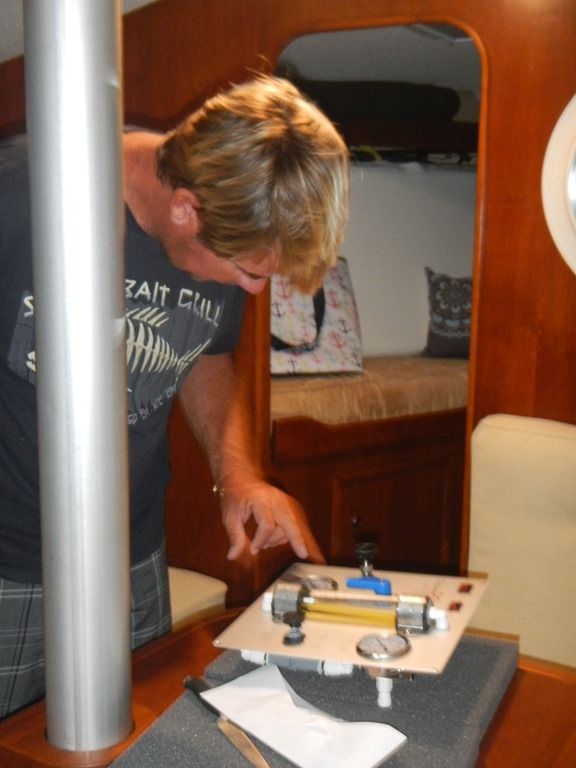 We called Rich to ask if the Cruise RO needed it’s own dedicated through-hull as we knew some other manufactures will consider the warranty voided if it is not provided its own. It is not required for the Cruise RO BUT…. Rich explained the needs and even has a YouTube video addressing this question. We have ours Tee-d into the head intake, just like he has his. This saved us a haul out and another hole in the boat. We have integrated fiberglass tanks that I have never felt comfortable drinking from, they have been sealed with an unidentified coating so we use that water only for bathing. With our old RO system, we just used three 2.5 gallon jugs and filled them up directly from the water maker. It took almost 2 hours to fill each jug. With the new unit they would be filled up in just minutes so we needed a new process to collect and hold the RO water or we were going to be kept very busy while the unit was running. To solve this, we installed a third water tank. It is fed directly by the water maker and is higher than our main tanks. When it fills up, it then starts to flow into the main tanks by gravity (we don’t have to do a thing). This new small tank, which is in the galley, has a spout for filling our water jugs for drinking and cooking. That part of the system still works well for us so we are keeping it. The additional perk to having the third tank is that the back-flush of the membrane uses water from this tank instead of the main tanks. The membrane is sensitive to bleach and this water will have never been treated- it still goes through the required charcoal filter. It sounds complex, but it actually simplified things for us. The main thing was to make sure everything was properly vented as backpressure will damage the unit. It’s hard to admit you made a mistake, especially an expensive one, but we did and here is our admission…. We chose the wrong water maker. It was one of the most expensive pieces of equipment we added and had done months of researching before selecting one, but we still got it wrong. So wrong that we are removing our perfectly good operating unit that is only a season old and spending what is, to us, several months worth of cruising budget to buy a different unit. At the moment the new unit is sitting in Florida waiting for us. I generally don’t have the interest or energy to do much technical writing on this blog but I know we were not alone in the flaws of reason that led us to make the wrong decision in the first place so for any one else in the process of selection a water maker I want to share our original thought processes and discoveries. Hope it helps. First, a quick backtrack. We had narrowed our choices down to two very different units when we first started this search: the Katadyn PUR 40e and Rich Boren’s Cruise RO Seamaker20. Besides turning sea water into drinking water, the units are almost like comparing starfish to puffer fish. In very brief summary the Katadyn unit is teeny-tiny (about the size of a shoebox), runs off 12v (4.5amps), and is simple (nothing more than an on/off switch). It makes a little more than ONE gallon an hour. The Cruise RO unit is robust (our shipping receipts says it came in six different boxes), runs off AC (Honda generator), and is more complex in that pressures and outflow may be adjusted (and monitored). It makes a little more than TWENTY gallons an hour. (There are also Cruise RO units that make over 30, even 40 gallons per hour!) Note, we know there are other 12v units out there that are more efficient and had higher outputs than the Katadyn-but out of our price range, and, there are other AC units out there besides the Cruise RO- but the quality of materials excluded them from our consideration. So, for us, we narrowed it down to these two units; the Katadyn and the Cruise RO. Here is how we rationalized the differences between the units originally and our reflections after one year of cruising. The most obvious difference between the water makers being, one-plus gallons vs. twenty-plus gallons per hour. While it seems obvious which one is the winner here, we honestly believed that we just needed enough RO water for drinking and cooking. More water could never be a bad thing, admittedly, we just didn’t rate it as the highest priority in the selection process. We assumed we would either collect rain water or purchase water for our showering and other water needs. We have separate tanks for these uses. In reality, the Katadyn has done exactly what we’ve asked of it, it does provide enough water for cooking and drinking, but nothing more. We’ve also come to realize (admit) that we still desire more fresh water. Collecting rain water in the winter just doesn’t happen (its rained once in the last six months) and lugging very heavy jugs of water in the dinghy from shore is not so fun. More than that, we would like to have more water supply to do things like wash gear, the deck, the windows, clothes, the salty dog, ourselves. Sometimes an extra long shower would be a real treat and currently the rate it takes to make a glass full of water with the Katadyn compared to the rate it takes to flow from our faucets is very, very imbalanced. The next most obvious difference to contend with is the power source, 12V vs. AC. This is where we got hung up. We crave redundancy on this boat, and this is where the Katadyn unit shined for us originally. In theory we would just run it off of solar alone but the engine or even the Honda generator could power it if needed too. Hell, it even came with a hand pump if we things got that bad. Multiple sources of power-this was originally a higher priority than the output. Our original biggest concern with the Cruise RO system was that if the Honda Generator broke we would have no way of running the water maker. We voiced this concern with Rich Boren, the owner of Cruise RO and a fellow cruiser, and his answer was so swift and assured. He said, “If my Honda broke, I’d be fixing or replacing it ASAP”. I wish we had truly understood that response at the time. In reality, our solar panels do not provide us enough power to run the water maker. This is not a fault of the water maker, but a limitation of our current solar array. But, what this means is we pull out and start up the Honda generator almost every single time we run the water maker. Now, if we are having to run the generator anyway—those extra 19 gallons every hour that we are NOT making start to get missed! Do you know what I could do with an extra 19 gallons of water– every hour? It only took us about three or four months of cruising for us to start admitting that we should have gone with the Cruise RO unit (another eight or nine to do something about it). And now we understand- if our Honda generator broke, we’d be fixing it or replacing it and for more reasons than just a water maker. And besides, if it ever came down to this, we learned the Cruise RO system can be pickled under 12V power so no risk of damaging a membrane, a concern that we got so stuck on in our original decision making process. A few factors have not changed for us since we began researching which unit to buy, primarily quality of materials and size of unit. We were always more impressed with the quality of materials used in the Cruise RO unit than any other from the start. The high pressure Stainless steel pump head and body, along with several other components, come with a full lifetime warranty. ALL parts are non-proprietary, meaning everything from the membrane, fittings, and chemicals can be found all over the world. We also always agreed that the service and warranty of the Cruise RO system was easily the most reassuring we had found in the industry. While our Katadyn has functioned adequately and we cannot fault it we did have to completely rebuild it already, after only 300 hours of use, and have found that this seems to be pretty standard amongst everyone we have talked to who owns one. Meh. As far a size goes, the tiny 12V unit couldn’t have been any better. Of course I suppose something that makes 20x the amount of water is going to take up a significant more amount of space. Here it comes back to a priority thing and “more water” has moved up the ladder. The nice thing is that the Cruise RO system can be installed modularly. Meaning each piece can be installed in a different location as needed. I.e., the membrane in one location, the pump in another, the control panel in yet another. This should make fitting it into our tiny, odd shaped spaces a LOT easier. (We will let you know- we are eager to start installing it as soon as we get back to Florida will do a post on the installation process).